What’s a girl with plenty to do, to do? Paint her mixer! This is a project I had been wanting to do for some time. 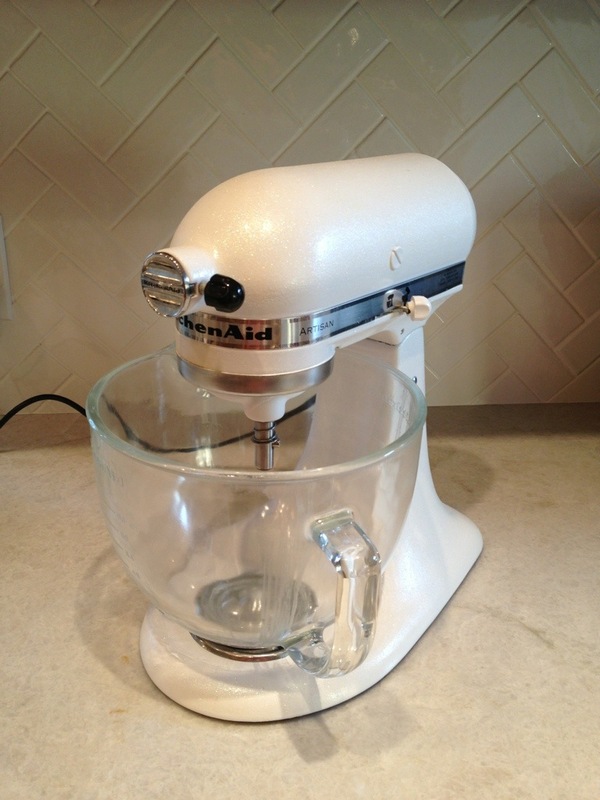 I got this mixer 8 years ago when there were only a few colors offered. I picked black because I had just gotten hip, new stainless steel appliances. 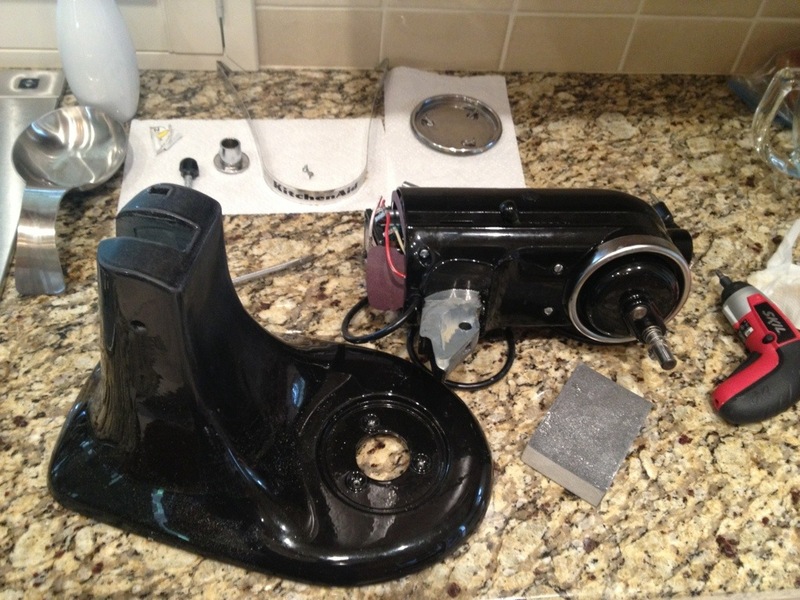 Way back in the dinosaur days of stainless steel, the sides of most appliances were black. The silver mixer didn’t look great with the brushed, stainless finishes, so I went with black. White was SO dated “way” back then. Have I mentioned I love shiny? You can take the girl out of the pageant… more in my insatiable desire to make my world shiny later on in this and later posts. After some minor disassembly with my trusty Skil, I painted it with Rust-Oleum white appliance paint and later Rust-Oleum High Performance White Gloss Enamel. I recommend the former for this particular project along with lots of patience. 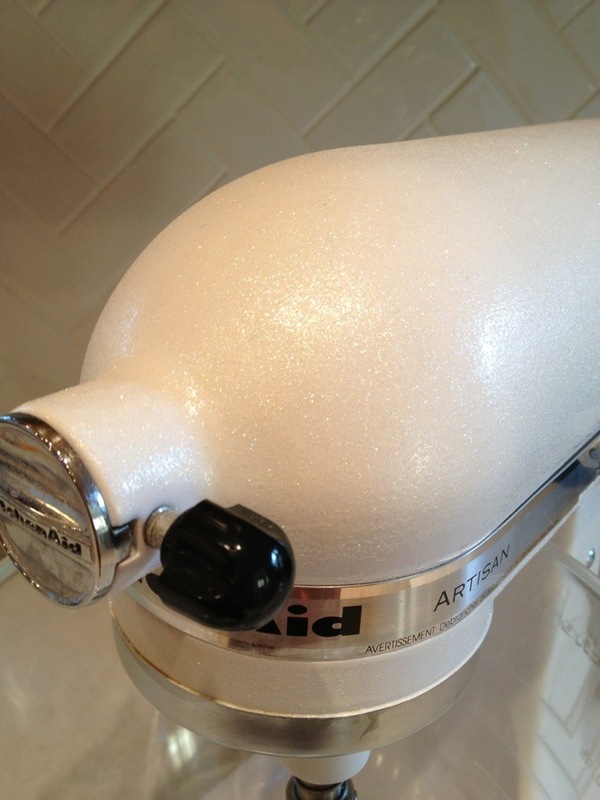 Later I added Martha Stewart’s Glitter Specialty Finish. 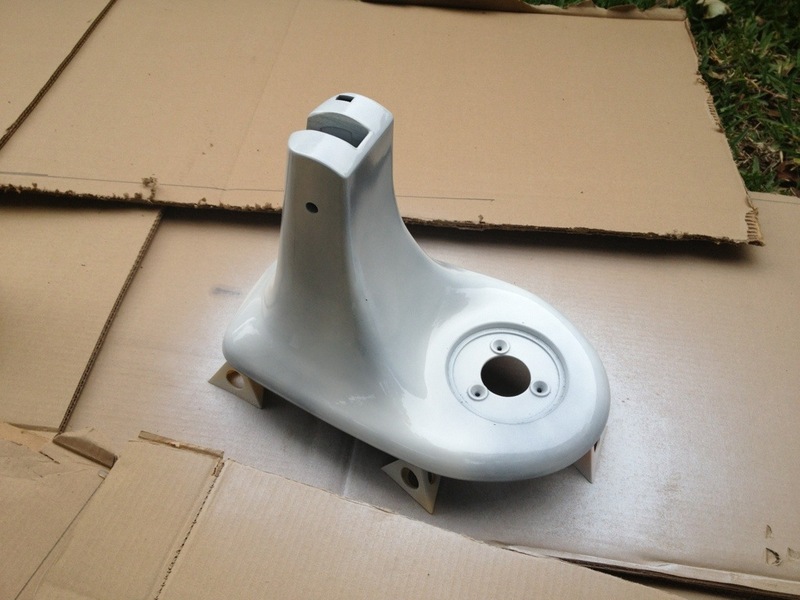 Painted each piece in many, light coats with Rust-Oleum white appliance spray paint – this left random, tiny blobs for some reason so I ended up lightly sanding and going over it with some Rust-Oleum High Performance White Gloss Enamel that I had on hand (which works better in thicker coats). It looked better before I messed with it which is why you (and I) should always remember when to quit when painting! Re-assembled and started at it for a few weeks before deciding to try a white glitter Martha Stewart’s Glitter Specialty Finish. Coat after coat of the glitter finish! 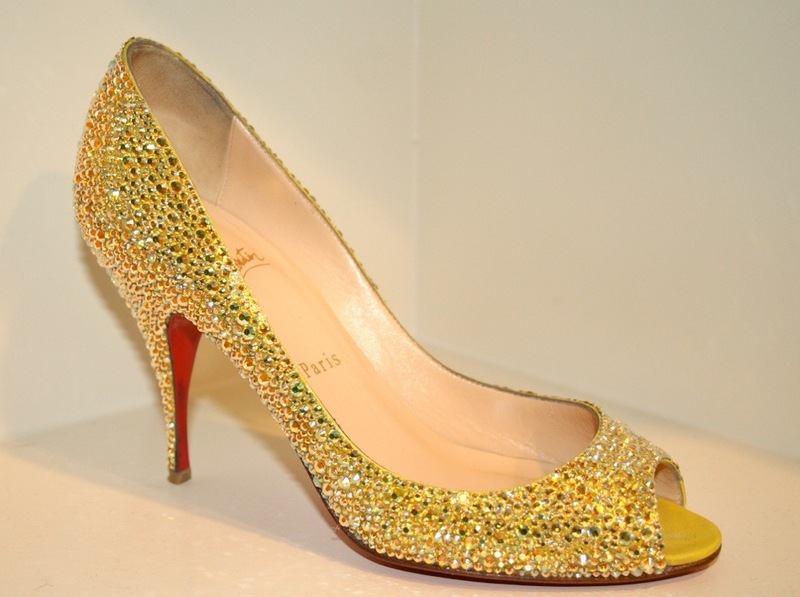 Does this surprise you from a gal who once glued thousands of Swarovski crystals to a pair of shoes one-by-one? It’s hard to capture how sparkly this really is. As you may notice in the close-up final photo, there was some discoloration where oils seeped up from inside the mixer. I thought I had cleaned this well, but this may be inherent to this project when painting a lighter color. If you try this, clean it until you can clean no more. It doesn’t really bother me, but I can see how it may bother some. 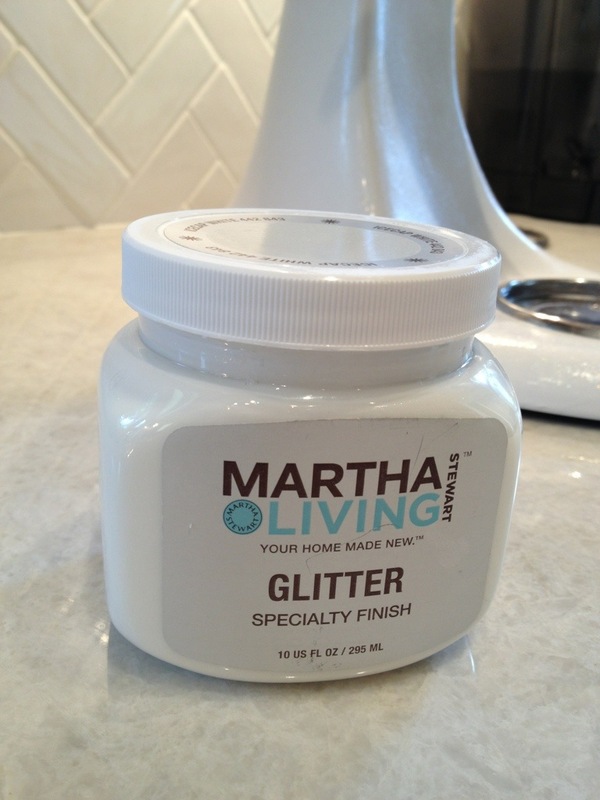 I have mixed feelings (no pun intended) about the Martha Stewart’s Glitter Specialty Finish. 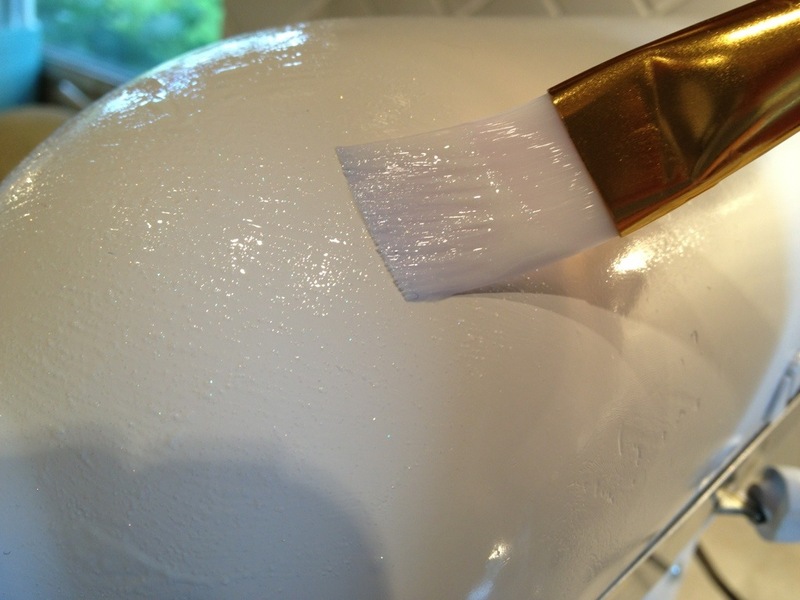 It’s pretty, but it’s basically glorified glitter mixed in glue. I picked it up when getting a different specialty finish for the girls’ bathroom (that’s a hint to what’s going on in there!) and thought I’d give it a try. I used so many coats that I lost count in order to get a deep, consistent finish. I’m not sure how well it will hold up to cleaning — that will remain to be seen. I usually clean it by just wiping it down with a disposable kitchen wipe or a wet towel so I’ve never been too harsh with it. Will anyone else by customizing their mixer?